There’s nothing that I can say about the blazer that you haven’t already heard. It’s timeless, chic, effortless ... need I continue? Let’s just put it this way: if you don’t already own a blazer, now’s the time to invest in one! As far as wardrobe staples go, a black blazer seriously cannot be outdone. There is no accessory or other article of clothing that can achieve the same level of perfection. Pair it with everything from a simple v-neck tee to a pretty silk blouse, and you’ll be blazer-ready before you know it! As far as blazers are concerned, I can’t think of a better runway collection to emulate than Rebecca Minkoff’s Fall 2012 show. At College Gloss, we love Rebecca Minkoff’s edgy and playful designs. The casual, yet still put-together look above is so attainable -- and believe it or not, any one of you could totally pull it off. Just think of the outfit possibilities -- from the classroom (in this case, skip the high-heeled booties and settle for biker boots) to a night on the town, there’s no shortage of occasions for donning your blazer! Colored jeans are so major and shouldn’t be underestimated. 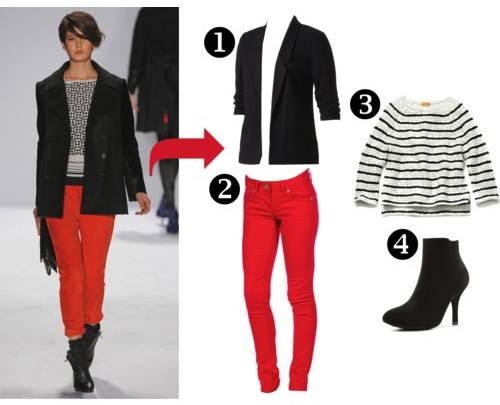 The fiercest of them all, red jeans especially pop when worn with a stark black blazer and booties. Whether you cuff your skinny jeans like the model does or wear them scrunched around your ankles, that’s up to you! Next is a bold black-and-white geometric or striped sweater. This season, pullover sweaters with intricate patterns, straight lines and overlapping shapes are getting plenty of attention. Instead of merely throwing your sweater over jeans and calling it day, add a blazer. The smallest detail makes all the difference; thanks to a blazer, your seemingly simple ensemble just got a lot more sophisticated. Style Tip: With so many types and styles of blazers to choose from, it’s easy to give up and convince yourself that it’s just not meant to be. As with any trend, you’ll need to find the right blazer that fits your style and complements your figure. From the oversized boyfriend blazer and preppy tweed jacket to a streamlined blazer with long lapels, there’s more than one blazer silhouette out there. What’s your favorite runway collection this season? Leave a comment below and, who knows, maybe it’ll be incorporated into the next look for less! Red pants. Work it ladies! HOT HOT HOT. I love blazers-- and this look! I actually wear my own version of this all the time. I love College Gloss!